As the asparagus season begins to come to an end, June sees the arrival of fresh peas. Frozen peas are available all year round, but fresh garden peas are available from early June until the late July. Mangetout out are undeveloped garden peas, picked while the pod is still edible. Similarly, petit pois are young garden peas , picked and shelled when small, young & tender. Unlike mangetout pods, the pods of garden peas are too tough to eat, but popping fresh peas from the pod into your mouth is one of life's great pleasures. 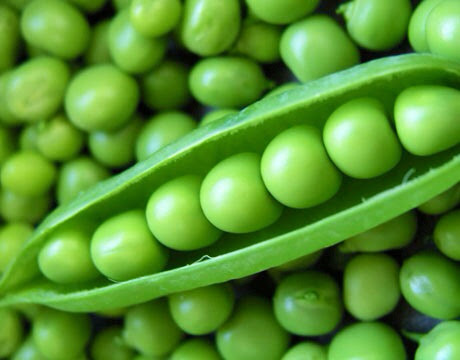 Cook the peas in boiling water until just tender, drain and cool under running cold water. Melt the butter in a large pan before adding the pancetta, cook for a few minutes before stirring in the cabbage. Cover and cook on a low heat for 10-15 minutes or until tender. Add the peas and heat through, season with salt & lots of black pepper before serving. This makes a fantastic side dish with roast chicken or roast beef. Why not put this easy dish on the table tomorrow with your Sunday roast dinner?